It's over now, but this is what we did. This is our recent archive. We're honoured to be able to present to you, a show of such talented Artists. There is some awesome Art for you to discover and explore. We are increasingly living in a social environment where there is so much angst that it is easy to miss all the ongoing and everyday moments of beauty that are being created. Enter, and immerse yourself in the unique worldview that Artists offer. 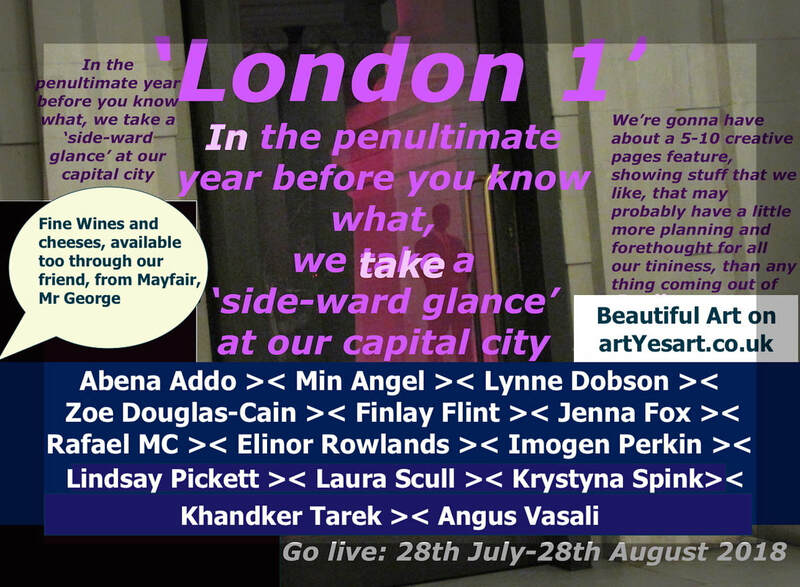 Of course beauty is in the eye of the beholder, and we love all the work in this London1 Online Show, and we hope you do too. There is a great deal of variety, and that's just the way we like it. Here at artYesart.co.uk, we have a space for Artists to stay with us longer than a month, should they wish, it is artist run, and you can find out more about all of that on our contact form below. 'Artists and Patrons, contact us'. We would love for you to show our featured Artists some love, of course, buying work is one way of supporting the ongoing creativity of Artists, but as well as that, just a heartfelt word of praise, or encouragement, or peer-to-peer engagement is also an important aspect of it. We know that Art is one of those things that people love to gather around, and to have a nice glass of wine, so we have partnered up with our friend, Mr George, who has some really great wines to enjoy at your leisure. So don't be shy. Contact the Artists, with genuine comments if you would like to say, anything to them, about their work. Contact Mr George, with your requests for now, or for the future in the provision of fine wines and cheeses. ​Please to enable the continuation of this feature, keep it respectful. Thanks so much. Thank You to all of the Artists who have taken part in this online show. Their work is outstanding. Very exciting. Be sure to let them know, they're appreciated. It's not to late to be involved with this year's show. Click here to find out HOW. We’re not surprised – it's one downside of the online experience. BUT contact our wine merchant friend Mr George by completing this contact form, right, and see if he has anything that takes your fancy. ​and some wonderful cheeses too.". ​friend, Mr George, of Mayfair. ​From the first Thursday in August, we will have our first 'Artist of the week'. Their work will appear here, and we will use a number of criteria, one of them will be visitors to Artist's pages, so be sure to spread the word. our business friends, will also increase your opportunity, for being featured here, and on our Facebook Page, should you wish. It will be assumed, that you do, otherwise, please contact us via our existing communication channels. Artists we want you to join us on a more permanent basis. We are welcoming new Artists THIS September. Inbox us for an informal chat. Artists and Patrons, we need your future participation. Thanks so much. London is a diverse city. There are so many ways of expressing oneself, and they say if you are tired of London, you are tired of life! So welcome to our London1 show, we are publishing this show at a crossroads in the history of the UK, and London, whether we approve or not, is the capital city. How do people visually express themselves? What of sounds? We have a mini-show for you to experience and enjoy. So be sure to come back regularly, and experience, what we have to offer you. We've been really lucky to be able to welcome the work of schoolchildren on board, to be seen alongside the professional and dedicated Artists whom we are showing. These pieces are the result of a delivered project within an East London school, so their page will be a literal one, East End. So come back for that. Coming soon. ​and Businesses who have/will be taken part in this independent endeavour, particular shout out going to: Louise Atkinson of Curator Space. Thank You. You can show her some love via her own website. Click below.